A manufacturer of wind electric power generation equipment was experiencing SAE J514 style O-ring only plugs backing out of the manifolds that were installed in their equipment. The leaking created two unacceptable conditions. The first was that the leaking equipment was on a tower in excess of 150 feet in the air. Servicing / repair became a critical problem. The second was the environmental impact the leaking hydraulic fluid was causing on the desert surface below the towers. The manufacturer of the SAE J514 style plugs that were backing out recommended that the manufacturer contact EPCO and consider replacing the original SAE plugs with Zero-Leak Gold Plugs. 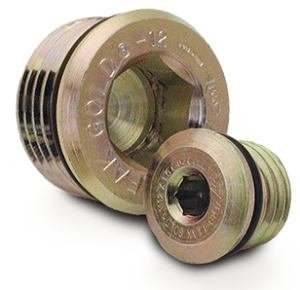 The original SAE plugs were replaced with Zero-Leak Gold Plugs. No leaks have been reported. No leaking manifolds and no environmental impact liability attributed to leaking plugs.